Be the first to share your favorite memory, photo or story of Dwayne. This memorial page is dedicated for family, friends and future generations to celebrate the life of their loved one. Dwayne "Smitty" Smith had a zest for life and an intense love for family and friends. He graced everyone with his large and charming presence, always a smile on his face. He openly and readily shared his sense of humor and joy with everyone. He thoroughly enjoyed an engaging conversation and considered anyone he met a friend. His passion for life and love will continue to inspire all he touched. 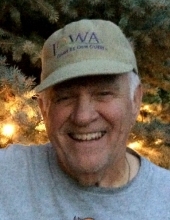 Dwayne passed away at The Friendship Home in Audubon, Iowa on Sunday, November 11, 2018, surrounded by his family. Dwayne began his career at Central National Bank while attending Drake University. He then went on to have a very successful career with the Iowa Des Moines National Bank before moving his family to Cedar Rapids where he became the CEO and one-quarter owner of the United State Bank. The family then moved to the mountains of Colorado where Dwayne owned a property development company, Paradise Properties, and the El Camino restaurant in Dillon, Colorado. The Federal Home Loan Bank as well as family ties brought them back to Iowa. Dwayne and Donna have lived at Lake Panorama for 18 years. He will be terribly missed by his many friends as well as his family; wife Donna of 57 years, daughters Lora (Mark) Hacker, Cara (Bob) Craig and Jill (Jay) Schroeder. He was also an extremely proud Grandpa to; Nathan and Veronica Craig, Dakota "Blayze" Schroeder, Zachary (Leta) Schroeder, Kassidy (Tyler) Carpenter and Alexzandra Schroeder (Abou Tchalombo). He was preceded in death by his parents, Marvin & Winifred (Sisson) Smith, step-father Vern Six, step-mother Maxine Smith, and brother Sid Six. The family requests that in lieu of flowers donations be made in Smitty’s name to The Friendship Home in Audubon or St. Croix Hospice in Panora. The family is also planning a Festive Remembrance of a Life Well Lived to be announced at a later date. To send flowers or a remembrance gift to the family of Dwayne "Smitty" Smith, please visit our Tribute Store. "Email Address" would like to share the life celebration of Dwayne "Smitty" Smith. Click on the "link" to go to share a favorite memory or leave a condolence message for the family.